What are the Benefits of Sealcoating in Tampa, Florida? Those who own and manage property in Tampa Bay should be aware of the benefits of sealcoating. Asphalt surfaces must be sealcoated for a variety of reasons. 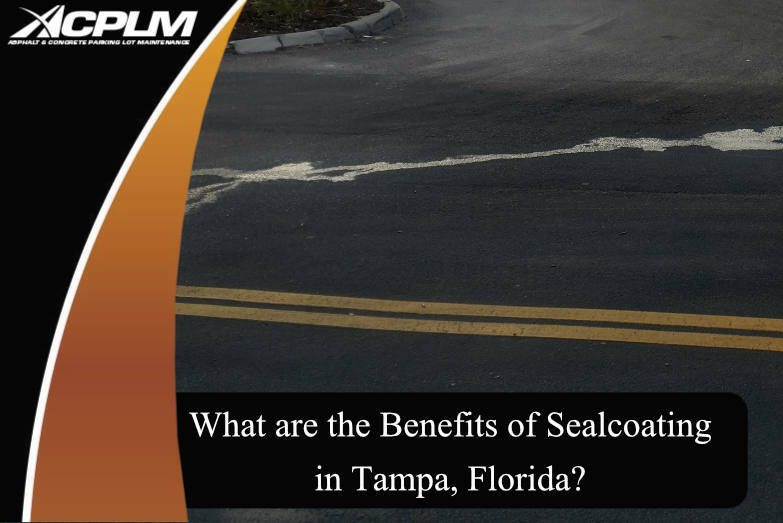 Let’s take a look at the primary benefits of sealcoating in Tampa Bay to help local property owners get a better understanding of the importance of this maintenance procedure. A professional sealcoating guards your asphalt surface against myriad threats such as oil and gas spills. If these harmful liquids make contact with your asphalt, the surface will gradually break down. The inevitable result is deterioration and costly repairs. In some instances, the deterioration reaches the point where a full replacement is necessary. The benefits of sealcoating in Tampa extend to protection against water. Water is a serious threat to the integrity of your Tampa property as it weakens the asphalt’s base and spurs the formation of surface cracks. It is imperative that water does not reach the asphalt’s base material. A proper sealcoating will stop water from moving through the porous surface of the asphalt and reaching the base and soil. Sealcoating benefits extend all the way to limiting oxidation and offsetting the effects of inclement weather. Let ACPLM sealcoat your Tampa property and it will thwart the oxidation of asphalt. This procedure also weatherizes asphalt to prevent damage from harsh rain, hail, sleet and the sun’s UV rays. Have your Tampa property sealcoated once every two years and you will save money on repairs and maintenance. A sealcoating’s protective qualities reduce cracks and other problems that will eventually require repairs as time progresses. So don’t sweat the cost of a sealcoating. This is a much cheaper and effective solution than paying for repairs one-by-one as they develop. There is no sense in paying for ever-increasing costs as the years go by when you can prevent the problems in one fell swoop with a professional sealcoating. Ask other commercial property owners about sealcoating and you will undoubtedly find sealcoated lots prove to be much more affordable and effective than those that are only tended to when repair projects rear their ugly heads. Sealcoating benefits are as much about function as they are about form. A sealcoat applied in the proper manner at the right point in time will dramatically improve the look of your asphalt surface. This is the aesthetic improvement your Tampa property needs to win the battle of perception. A sleek, new-looking parking lot, walkway or other space will do wonders for customer perception of your Tampa business.